How to support people with disabilities with respect and dignity in the community. 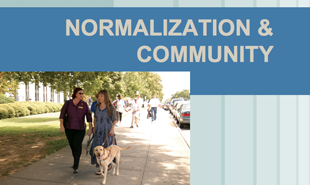 Discusses the principle of normalization and how to support people with disabilities with respect and dignity in the community. Provides some history, examples of ways people can be subjected to devalued experiences, and discusses the role of support providers. Reviews supporting positive language, appearance, individuality, competency, and self-determination, while discussing overprotection and segregation. Includes examples and exploration.